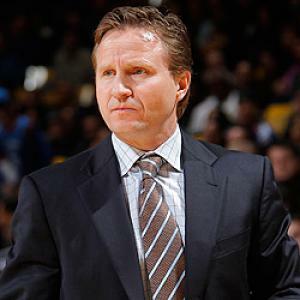 Scott Brooks was born on the 31st July 1965, in French Camp, California USA, and is a professional basketball coach and former player, who is currently coaching the Washington Wizards, and previously worked with the Oklahoma City Thunder from 2008 to 2015. Brooks won the NBA title as a player with the Houston Rockets in 1994, while as head coach, he received the NBA Coach of the Year Award in 2010, and was in charge of the Western Conference team in the All-Star games in 2012 and 2014. His playing career started in 1987 and ended in 2001, while his coaching career began in 2000. Have you ever wondered how rich Scott Brooks is, as of early 2017? According to authoritative sources, it has been estimated that Brooks’ net worth is as high as $10 million, an amount earned through his pro career as a basketball player and coach. Scott Brooks grew up in California, where he went to the East Union High School in Manteca and matriculated in 1983. He studied at the Texas Christian University, where he stayed for a season and played college basketball, then transferred to San Joaquin Delta College in Stockton, before spending his final two years at the University of California at Irvine, but then wasn’t drafted in the 1987 NBA Draft, so he joined Albany Patroons of the Continental Basketball Association, and then played with the Fresno Flames in 1988. Scott Brooks joined the NBA, and spent his first four seasons with the Philadelphia 76ers (1988-1990) and Minnesota Timberwolves (1990-1992), before moving to the Houston Rockets, where he won the NBA championship in 1994. Scott then played for the Dallas Mavericks (1995-1996), New York Knicks (1996-1997), and Cleveland Cavaliers (1997-1998), and ended his playing career with the Los Angeles Stars of the American Basketball Association in 2001. Brooks also served as an assistant coach for the Los Angeles Stars from 2000 to 2001, and then coached the Southern California Surf in the 2001-2002 season. From 2003 to 2006, he was an assistant at the Denver Nuggets, while in the 2006-2007 season, Scott worked with the Sacramento Kings. Brooks joined the Seattle Supersonics and P.J. Carlesimo where he worked as an assistant, but in November 2008, he became a head coach and led the Oklahoma City Thunder to the play-offs in the next five seasons. He received the NBA Coach of the Year Award in 2010, while in 2012, he led the Thunder to the NBA Finals, where they lost to the Miami Heat. In the summer of 2012, Brooks signed a multi-year, $18 million contract, and that year Scott led the Western Conference All-Stars and was selected for the role two years later as well. In April 2015, Brooks was fired after failing to secure a playoff position, but left as the third best coach in the Sonics/Thunder history, after Lenny Wilkens and George Karl. In April 2016, the Washington Wizards hired Brooks as a head coach, and he is currently in that position. Regarding his personal life, Scott Brooks married Sherry Silvey in 1993, and has two children with her.